Cover image by Tania Willard. Download e-book by clicking above. 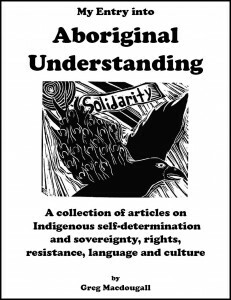 A collection of articles on Indigenous self-determination and sovereignty, rights, resistance, language and culture. In two PDF versions (for either front-to-back reading, or formatted to print doublesided and fold into booklet form). Please share. When I was living in Kitchener-Waterloo, I had the opportunity to attend and be involved in different things that opened my eyes to ‘Aboriginal Awareness’ (the name of a conference from which come a couple of the articles in this booklet). This booklet is a collection of writings that cover some of the learnings from that time. As part of IPSMO (Indigenous Peoples Solidarity Movement Ottawa), and with support from CUPW (Canadian Union of Postal Workers), I’ve been able to get a few hundred of these booklets into peoples’ hands without having to ask for money in exchange. Now, I’m also making this booklet available online. The intent is to allow people — who’d like to perhaps gain some new perspective, to perhaps find a way to become more in alignment with some of the teachings contained within — to read the booklet online, or print off their own copy(s). It is with great sadness but also a gratitude for all that he brought to the world, that I write here that he has recently passed on. If this booklet can help people understand some of the kinds of values or thinking that Grandfather approached life with, I would love to be able to help it reach as many people as possible. I think the content it contains is a good way for people with an interest in activism to learn more about Aboriginal culture, and conversely it’s an entry point into activism for people with an interest in the culture. Also, I received secondhand feedback that someone said she felt that this booklet would be really valuable to get into the school system. (So, if you know someone who works in schools, who might be able to use this in the classroom, please do pass this on). I’m planning to update the booklet with some more writings and also feature some videos I’ve made available online – and maybe look more at how to publish it and work on distributing it in the school system. When the ‘2nd edition’ comes out, I will likely take the original version down. So please do take the opportunity while it’s up to take a look, and consider if you know others who might like to see this (there’s a ‘social media sharing bar’ below, or just send an email with the link to this page/website). If you (or an organization you’re part of) would like to print multiple copes for distribution, please do. In anishnaabe there is power and sacredness of words. All people are considered equal. The language and culture cannot be separated. Basil Johnston says language is the key for ideas and aspirations. spirituality -> gzhe-mnidoo, which represents the great mystery. She talked about how there’s this balance, where people in a society have different roles, that they’re good at, and how everyone doing what they do best is in the best interests of the society. She described the buffalo hunt. First, it is the role of the spirit doctor (not the Asian name ‘shaman’, she says she hopes no one still believes in the Bering Strait theory, none of the elders’ stories talks of coming over the Bering Strait) .. it is the role of the spirit doctor to go into transcendental state, to see it is time. Then it is the turn of the buffalo caller (also a spirit doctor), who prays and calls the buffalo to come to the hunters. The buffalo (tatanka) spirits are happy to offer themselves to the hunters if they will take only what they need, use everything, and waste nothing – if they will honour the buffalo. Calling the buffalo will lead to hearing a rumble on the horizon. It is important that we all work together, collectively, different aboriginal peoples working together, and aboriginal and nonaboriginal peoples working together. It was noted that something that is often not mentioned is how the support of non-native people has been very important in the struggle for native rights and way of life. We have to realize that the government, through repressing and taking away native culture, has been committing the soft manner of genocide, not as blatant as shooting or gassing, but equally as effective in killing a culture.